Enter the Year of the Dog this February with your pockets full thanks to our newest game, featuring 5 reels and 50 flexible paylines, the online slot, Fu Chi, from Real Time Gaming. Influenced by Astrology and the Chinese Zodiac, this game is full of lucky symbols that will undoubtedly bring you big payouts! Additionally, the two progressive jackpots, which can be randomly triggered at the end of any round will definitely help things heat up this winter! Like in many online slots, in Fu Chi, winning combinations are formed from Left to Right, however this rule does not apply to the Scatters (Zodiac symbol), which pays on any combination. Landing 3 or more scattered Zodiac’s on the reels will earn you free spins. Scatter wins are added to line wins and multiplied by the total bet. With the maximum award being 30,000 times the bet line, you can except some massive win potential! 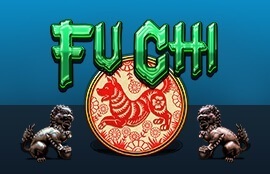 The Dog symbol acts as a Wild in the Fu Chi online slot, which can substitute every other symbol, including the Scatter, which makes it much easier to trigger free spins here than in most other slots. Landing 3, 4 or 5 Scatters anywhere on the reels will get you 15, 20 and 30 free spins, respectively. The number of free games will be doubled if no Wilds appeared in the triggering combination, meaning you could spin up to 60 times for free. Your prize is doubled whenever the Dog does appear in a win, to make up for all the free spins you didn’t earn. Otherwise, re-triggering the free spins feature is also possible and will get you the same number of free spins as the original trigger, meaning that you could spin up to a woofin’ 120 times for free, in a single round! With this slot available on Instant Play, Download and Mobile, you have the chance to make epic wins from wherever you are; at home, during your commute to work, or even out in the wilderness... Go ahead and try out this online slot at Jackpot Capital online casino today and see what the Year of the Dog has in store for you!